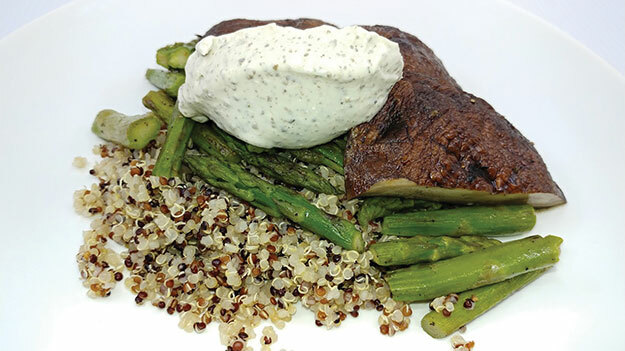 Like many people, Chef Mike Komiti, owner of Made to Fit Meals, struggled with weight issues and the resulting health issues of prediabetes and moderately high blood pressure. His doctor informed him he needed to make some dietary changes or risk severe health problems in the future. Prior to becoming a chef, Komiti served in the Army as a combat medic with assignments at Fort Lewis and in Wuerzburg, Germany. "I did some research and visited a registered dietician. I learned so much about different fad and science-based diets, but had not decided which direction I wanted to go," Komiti explained. "Coincidentally, one of my work colleagues mentioned that she was working part-time for a meal prep company focusing on the Paleolithic Diet. After more research on my own, I chose to try the Paleo Diet. I focused on eating whole, organic, natural and wild ingredients. I stayed away from grains and high-carb, low-fiber foods. I made sure to consume plenty of vegetables, clean fats, fruits and water. In six months, I lost 35 pounds. My blood glucose and blood pressure was finally under control." Initially, his decision to focus on healthy foods was personal but he began to find out that there were not many options for fresh meals to purchase. "I feel the perception of not having enough time, rising costs, and convenience is an excuse for people to make poor diet decisions. I want to help people take a step forward. I want people to know that there are businesses that really care about your wellbeing. I want to prove that healthy food can be affordable, convenient, great tasting, satisfying and sustainable," he said. Komiti founded Made to Fit Meals with those goals in mind. Komiti's food fits the bill for clean eating. "Clean eating is understanding where your food comes from and how it affects you. The foods that are best tasting and most nutritionally beneficial for you are fresh foods that are naturally grown or raised nearest to you. It's about ingesting the necessary and rejecting the unnecessary," he said. He makes fresh meals and delivers them only in the Puget Sound area. They are made to order and delivered to your home in a refrigerated truck ensuring not only healthy food, but meals that are safely prepared in a commercial kitchen. "Every ingredient that goes into our meals is either organic, natural or wild. We chose healthy safe fats for cooking and making sauces. We only use the freshest produce and proteins available to us. We pay attention to the seasons and introduce new local ingredients on a regular basis to ensure customers are getting a ‘bang for the bite'. All of our meals are scaled so you know how much protein, fat, and carbohydrates you are consuming, said Komiti. He now has a wide variety of clients. Athletes order to optimize their physical fitness results. He delivers to students, expecting and new parents and business executives that are too busy to properly prepare meals for themselves. He has delivered to the elderly or handicapped that have difficulty preparing meals. Komiti offers these tips for those trying to lose weight and they apply no matter which diet plan you follow. Prepare yourself -- Plan your meals and have diet compliant snacks ready for strong craving episodes. Separation is in the preparation. Eat whole foods -- Whole foods are fresher, more nutrient dense and more filling. Control portion size -- Not over eating is just as important as not under eating.